In the recent times the honourable chief minister of Kerala declared the state as a completely electrified state, even though it was formally declared the remote of village of Bonacaud was in dark due to some problems. It was an totally unexpected work for students of NSS-CET unit. The project was carried out under the Vithura Grama Panchayath. The Bonacaud village is a part of Vithura Grama Panchayath, Trivandrum. 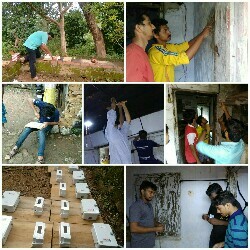 The lighting up of 65 houses was task taken by the 30 young engineers of CET. It was great task for volunteers who had heard of electrification only through books. The Bonacaud is high range place about 900m high from the sea level. The volunteers had to work under difficult weather conditions and completed 95% of the work in 12 days. The remaining work is expected to be completed in October first week. They literally worked under candle lights and lamps and were satisfied with the available resources. Since the buildings were made of old construction model,it was very hard to work. The poor living conditions of the people was main moto behind our work. The students of College of Engineering Trivandrum (CET) have always been together to lay the foundation for a self-less service towards the community through NSS. NSS-CET is one of the most active community in CET since then. Commenting on the work force of NSS, there are a 120 students enrolled in it. The community completely works under student panel with a faculty as their Programme Officer.